A basilar top aneurysm is one of those aneurysms that are difficult to treat. At present, endovascular surgery is given priority as the initial choice of treatment. Surgically, pterional or subtemporal approaches are the main routes for accessing the aneurysmal location., We present a case of a high-positioned basilar top aneurysm treated by a trans-third ventricular approach because of failure of the other treatment options, and discuss the problems associated with the management of this high-placed aneurysm in the elderly patient. 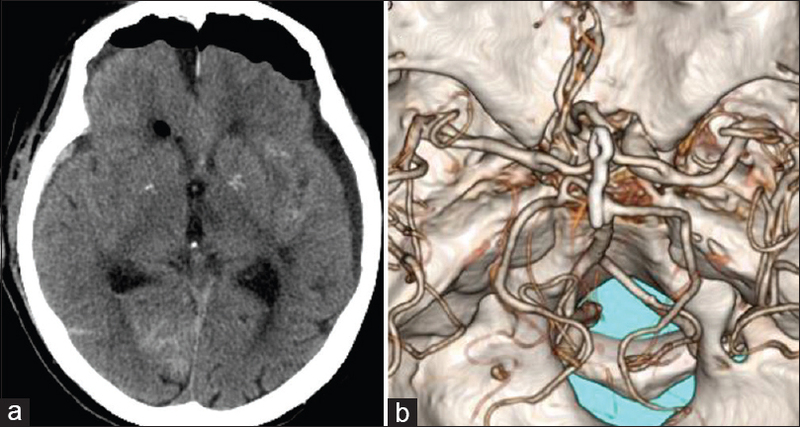 A 90-year old woman presented with severe headache. Computed tomography (CT) of the head demonstrated subarachnoid hemorrhage (SAH) caused by a ruptured high-positioned basilar top aneurysm [Figure 1]. In consideration of the better clinical Hunt and Hess grade of the patient coupled with the strong desire of the patient and her family to undergo treatment of the existing aneurysm, and her excellent activities of daily living (ADL) prior to her ictus, surgical treatment was planned. Although endovascular intervention was attempted as the initial treatment of choice, the catheter failed to reach the targeted lesion because of the arteriosclerotic tortuous parent arteries. Therefore, clipping of the aneurysm through the trans-third ventricular approach was performed. The surgery for clipping of the aneurysm was performed after the duration of vasospasm was over. A very narrow surgical corridor was made through the right interhemispheric fissure. The base of the frontal lobe was not breached, and the right gyrus rectus was resected to avoid over-retraction of the frontal lobe. Bilateral A2 branches of the anterior cerebral artery (ACA) and the lamina terminalis were easily identified, and the third ventricle was opened through the lamina terminalis. Removal of cerebrospinal fluid (CSF) made it possible to visualize the intraventricular anatomy. The premamillary space on the ventral side of the mammillary bodies were incised to observe the trunk of the basilar artery. Subsequently, the aneurysmal neck between the bilateral P1 segments of the posterior cerebral arteries was identified [Figure 2]. The aneurysm neck was clipped using a bayonet-type of mini-Yasargil clip. The postoperative investigation demonstrated successful clipping of the aneurysm without compromise of any perforator [Figure 3]. Though her neurological condition became stable and her rehabilitation was started, she expired due to aspiration pneumonia after several weeks. The sagittal view of the preoperative CT scan can help in the anatomical delineation of the floor of the third ventricle and in planning the approach to the aneurysm. The premamillary space in the ventral aspect of the mammillary bodies along the floor of the third ventricle is a safe surgical route because it is the same route used during the performance of an endoscopic third ventriculostomy. Saving the mammillary bodies is of utmost importance. For these high-positioned basilar top aneurysms, a trans-third ventricular approach was reported in the 1990s., At present, endovascular surgery, or the pterional, or subtemporal approaches are given priority as the initial modes of treatment., However, in difficult cases, a trans-third ventricular approach might be the approach of choice after a careful preoperative anatomical assessment has been made by the clinical imaging. 1	Drake CG. Bleeding aneurysms of the basilar artery. Direct surgical management in four cases. J Neurosurg 1961;18:230-8. Yasargil MG, Antic J, Laciga R, Jain KK, Hodosh RM, Smith RD. Microsurgical pterional approach to aneurysms of the basilar bifurcation. Surg Neurol 1976;6:83-91. Kodama N, Sasaki T, Sakurai Y. Trans-third ventricular approach for a high basilar bifurcation aneurysm. Report of three cases. J Neurosurg 1995;82:664-8.